Well, a lot went on, but when it's pretty outside we sit on the deck and it gets dark so late that dinner isn't over until eight or later and I go to bed at 9:30 to get up at 4:45, so there isn't much time for doing this page. Still, here is some news and some photos for the period above. Dates are a little doubtful. Maybe after daylight savings time I'll do a better job. The Better Boys are coming along fine. 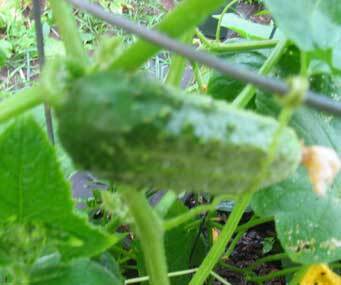 I've pulled four nice cucumbers so far. They seem to like the tomato cages. Ate one on the river today. Good! 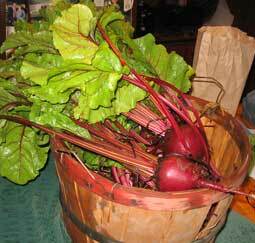 Still more beets and some still to pull in the garden before they get woody. Planting in mid-January seems to be the key. 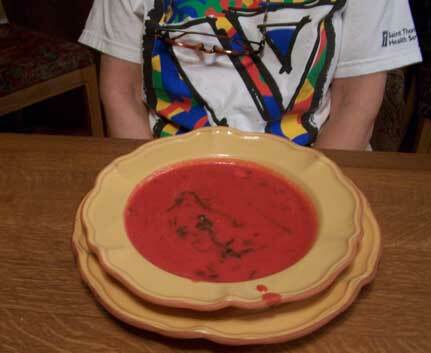 Beautiful, beautiful borsch! We finished up a tasty meal of it today. This cherry tomato is now part of Richard. 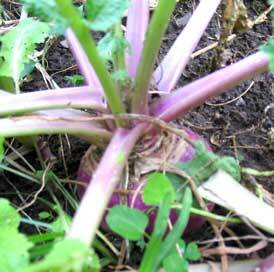 Nice crop of turnips. All pulled up now to make room for Roma bush beans. Gone are the sugar snaps and snow peas. Coming in now are the blue lake snap beans and florida butter beans. Between the beets and the turnips goes the first row of Roma bush beans. 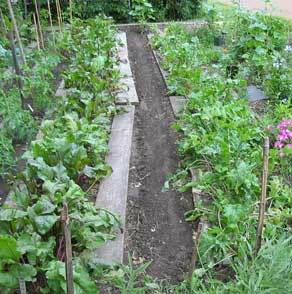 On the right the turnips have now made way for the second row. This is the fish I couldn't identify earlier. 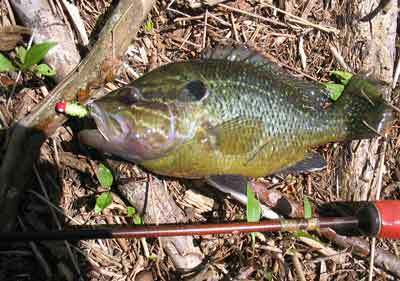 It's a shell cracker, a type of bream. 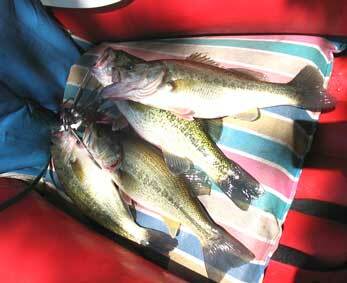 I caught few largemouth in this period. 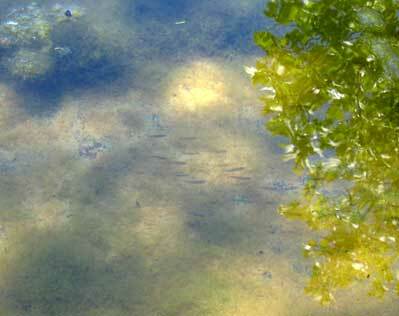 The creek is full of moss and the fish aren't interested. 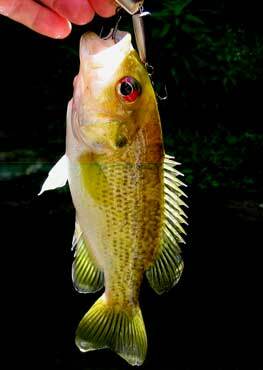 This small red eye is a type of bass. Note difference in mouth size and general shape. They get up to one pound or so. Small mouth took a plastic crawfish on a small jig. 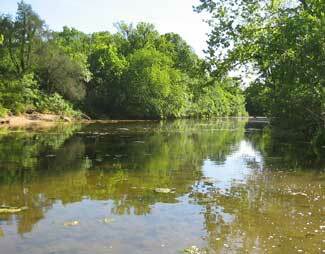 In contrast to my large mouth creek, the small mouth creek is still fine. 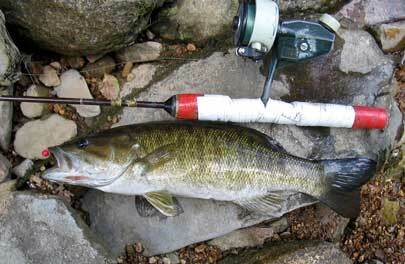 Here's the best small mouth of the day. Most caught on the crawfish and jig. I must have caught 10 or more total. Wendy gave me a book of maps of middle Tennessee fishing spots. Mostly maps, but there is also commentary which is pretty interesting. 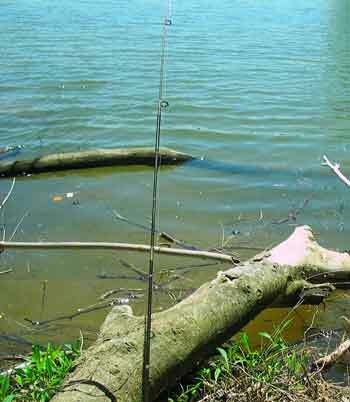 Covers the lakes as well as the feeder streams and rivers. 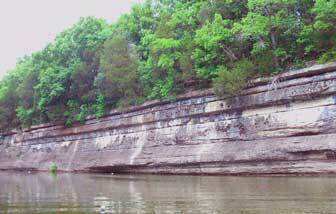 Today I decided to explore and picked the upper part of Percy Priest Lake, the east fork. Highest access seemed to be Mona Access, so I headed there. Put in and paddled upstream in the little blow up canoe. After an hour I decided I would not find the stream (it was still very deep and wide) so headed back. Caught a couple of bass on the way back and got a pretty good sun burn on the legs and back. Not painful and it won't last long. 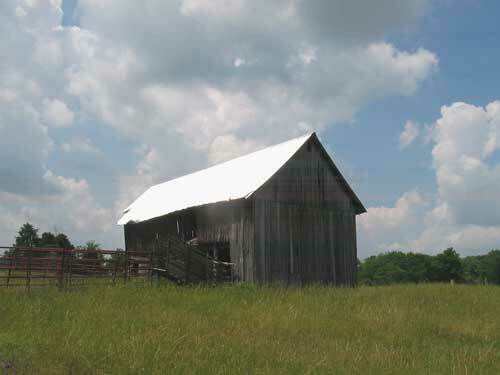 Only photos are of a long rock bluff and a beautiful barn caught just right as the sun hit the tin roof. 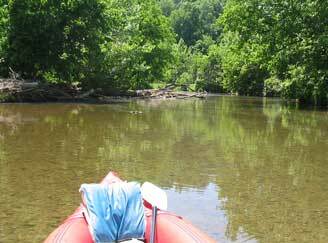 The East Fork is very wide and deep from Mona upstream this time of year. I think they drop the lake later on and the top of the lake can be found and the stream fished. Will see later on this summer. Almost what I saw. Beautiful image, but not quite what the eye saw. Maybe I'll have a chance to shoot it again in different lights. Well, I forgot about Monday being a holiday. I got up early. Because I woke up at 6 and couldn't go back to sleep because our new neighbor was standing knee deep in his back yard weeds picking and singing in his bathrobe with a black cowboy hat on his head Unfortunately this was right below our bedroom window. Obviously, he had just come in from a night of country music hell raising. Since it was not possible to get back to sleep I went fishing up on Creek C. It was lovely and I caught 4 nice bass aside from the 3 or 4 others that got away (including one that was--I swear-five lbs or better). A funny occurance was that I was working upstream for about half an hour just at the mouth when I became aware that I was now going with the current. Evidently, they had closed the dam and the rising water was floating my little blow up canoe up stream. Very nice. 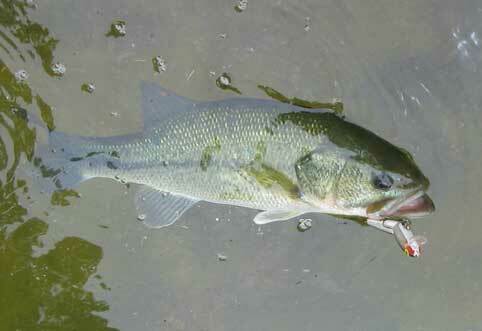 I kept the bass until I got back to the truck but decided to shoot a photo and let them go. Lucky fishies. Lucky me too. I didn't want to clean them. Here I'm up in the creek looking back toward the lake around the corner. The water looks shallow, but it would be over your waist not far beyond the boat. Too deep to wade at this point. Down here I caught all large mouth, except for one small small mouth. From the same spot this is the view upstream. A long shallow hole with deep spots. Just beyond the creek current begins again and the boat goes no farther. Next time I plan to paddle up there and wade up. 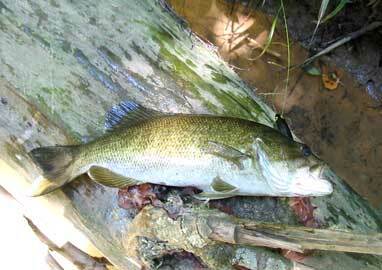 Small mouth will be in the runs. 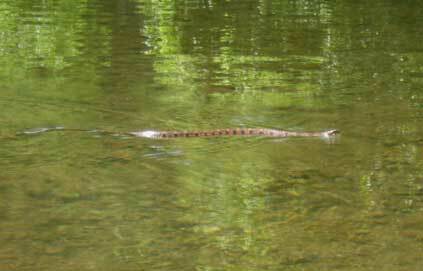 A very pretty water snake. I thought it was a cotton mouth until I got close enough to see the small head. Four nice 12-14" large mouth. Could have been dinner, except that I was not willing to fool with the cleaning. Maybe next time. Garden. I noticed yesterday that a lot of my okra has died. 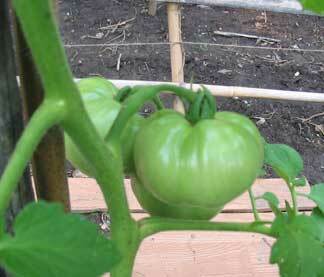 I had to plant it behind the pea trellis, so it was pretty shaded. But it also looked as if it needed water. I think it missed most of the water from my sprinkler, shielded by the trellis and pea vines. I watered it good yesterday afternoon and today I'll fill in the open spaces. I really have messed up on this because of trying to locate the peas where they'd get the most light without shading things out. The okra got pushed to behind the trellis. 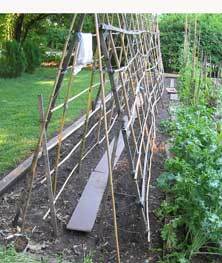 I thought maybe it would get high enough to get the light and that I could pick the peas and beans through it. Not a good plan. Still, I'm certainly not going to move that trellis until next year, if then. Too much work. 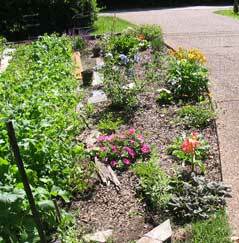 I might try to plant okra around the other edges of the garden. 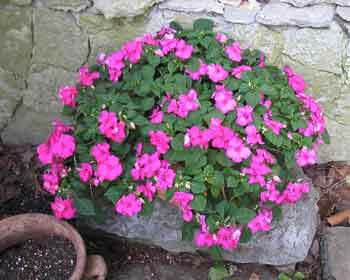 Maybe I can find a low growing variety that won't shade out the smaller plants. Stay tuned. I consulted my notes from last year and early June is when I dug under the snow peas and sugar snaps and planted the blue lake strings and Florida lima beans. So next week I plan to make some major changes. 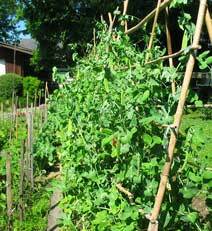 On Sunday I pulled up the bush peas and will dig them under and plant Romas there. We had them for dinner. Good. 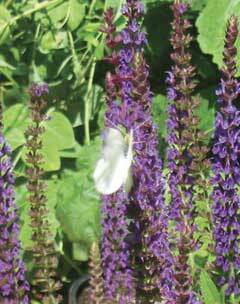 A white butterfly enjoys Mom's purple something or other. Little cucumbers may grow, but only in cages. 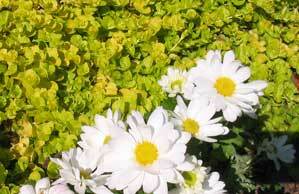 Yellow and white and green. 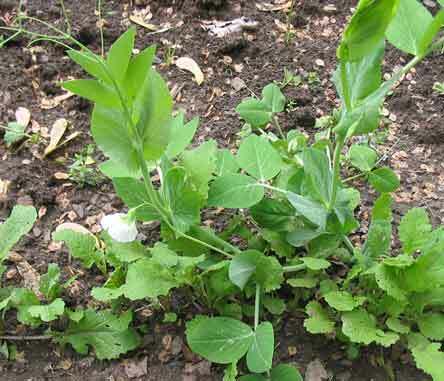 Snow peas and sugar snaps are at their height. Little pepper plants amidst the greens. Fishing. 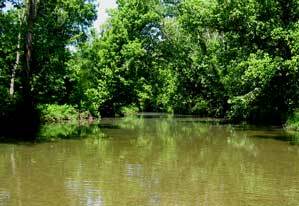 Saturday I went to Creek P and waded down to the lake. No luck until I was way down stream...Wham! Bass knocked the poop out of my jointed rapala, broke the line, then jumped repeatedly until he threw the lure, which I recovered. 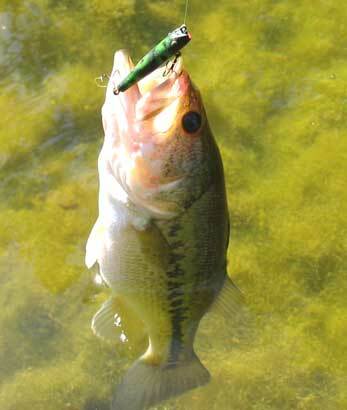 During all the jumping another bass (I swear it was 3 feet long) moseyed over to see what all the fuss was about. Ended up catching 4 or 5. About as many missed hits. At one point a vast shadow went over me. Later I saw it was a turkey banging through the upper woods on the east. Finally she flew over again. Confused. Sun was bright, but the day was very cool and pleasant. Went back Sunday and it was cooler and overcast. Should have been much better for fishing in that shallow rock bottom creek. Nope. Caught only one and he obviously demented. 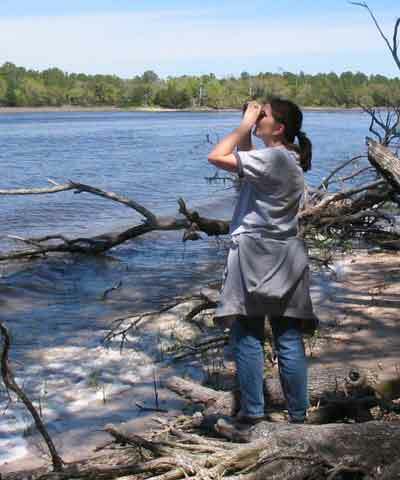 Saw a large heron, brown on top and brown and white on the breast with a yellow belly. Can't find it in any of the books. Went home early and discovered around 9 pm that the itching on my feet and lower legs wasn't just chiggers--I acquired poison ivy along the trail to the water! Saturday bass. See how bright the day is. Note the size of the jointed rapala. 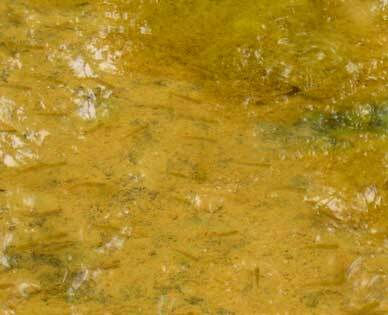 It's twice the length of the creek darter in the next photo and the fish are about the same size. I used to use creek darters all the time, but not that small. Mine were much larger. Probably not as effective as the rapala. They certainly made no attempt to imitate a real minnow. My last one was yellow with red dots all over it. Another Saturday bass. That little creek darter was one I got from George Collins. First thing I've caught on it It's only about two inches long so it makes this bass look quite large. Have to use it in all my photos. Hello up there, George. Thanks. These minnows are in two inches of water. Bass come in here early and late and make their lives exciting. 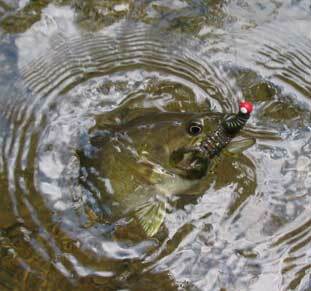 It is thrilling to see a huge swirl and splash as a bass attacks. I sometimes try to cast ahead of the furrow they make in this shallow water. This is the big hole just before the lake starts at the far end of the photo. Note the floating moss and the bottom, which is thick with it. About halfway down is where I've seen deer. Saturday I saw the turkey and Sunday the unidentified heron. It sat in the limb of a tree across the creek for minutes and I had a good look with my binoculars. Still don't know what it was. Maybe a young one. This is my one bass for Sunday. Note the darker day. This is why I didn't fish upstream. On Sunday I tried, there are clear places, especially along the sides. No luck, so I gave up and went back downsteam to where I was Saturday. I really don't know what fish this is. 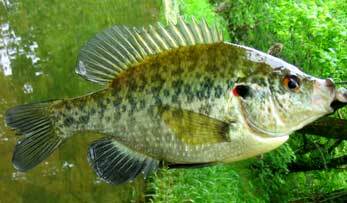 Looks like a crappie with red eyes and ears. Can't recall ever having caught one before. Almost like a red eye, but the mouth is too small. Another shot of the minnows on Sunday. 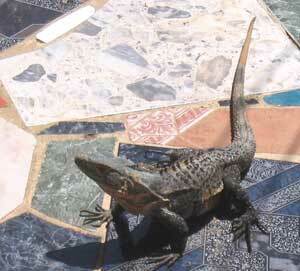 They are interesting to watch, but hard to photograph with the glare on the water and their darting little ways. Tried Center Hill again. Forgot to take my shorts so had to wear blue jeans. 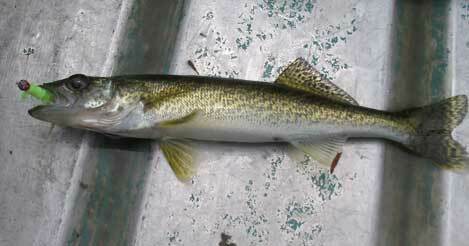 I did catch a lot of cigar size sauger and one 14" one fishing a little crappie jig just off the bottom. Switched to a 16th oz jig with a rubber trout colored minnow on it and caught some more. These were caught between the tree and the water fall, where the water is pretty deep. Also caught three nice trout on the latter rig. 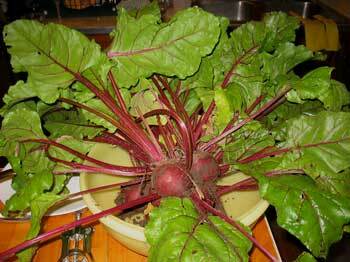 First of many fine beets we hope to enjoy this spring. This beautiful dragon fly was alive, but torpid, hanging from the rail of the deck when I settled down for a quiet beer one afternoon along about 6:30 recently. 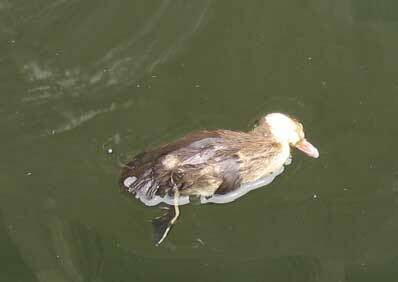 The little dead duck at Center Hill. I saw his two little siblings chugging about trying to climb the dam. I also saw a 5' long gar which could have killed any of them. But why was it not eaten? 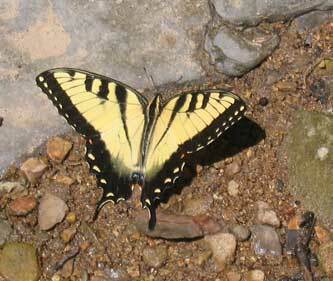 He/she probably just starved from being too ignorant to go downstream where there was cover and adequate food. Caught a lot of these little "cigar" saugers. Some on the 32nd oz jig you see here and some on a larger rig. Fun, but no "CIGAR," as we say. Yuk! Legal size is 14" and these were 11-12". Garden. 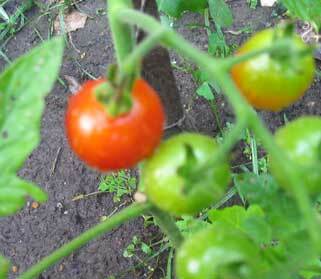 I planted tomatoes, peppers, and egg plants last week. This week I planted some more. 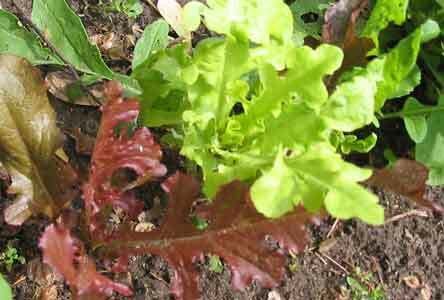 They are just to the side of the kale rows and other greens. I have to constantly pull leaves off the greens to keep them from being shaded out. Soon, however, I'll pull the greens and they'll have it to themselves. 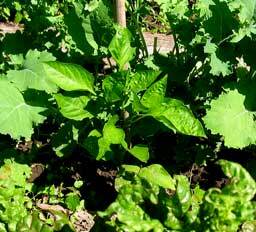 We have had all the chard, kale, and lettuce we could eat or give away and it's still going strong. 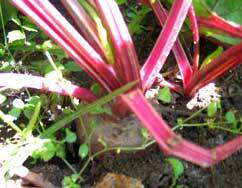 Also, very important, our beets are huge. Early planting must be the reason since in the past I've never had much luck with them. I checked and they went in on January 22 this year. Good to know. 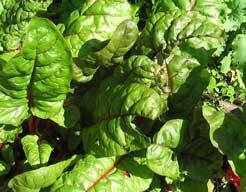 The greens are great and, of course, the beets themselves are yummy. 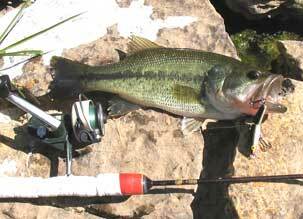 Went up to Center Hill and got skunked below the dam except for a couple of small bream, on little crappie, and a couple of stocker trout. Had to wear my rain outfit most of the day since it was cool and rained off and on all day. 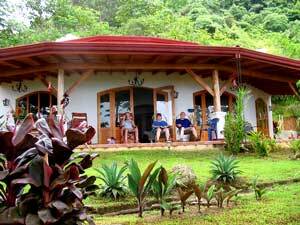 We went to Costa Rica with Rod and Wendy and stayed at Marcia and Craig's house in Uvita, which we rented. The process of getting there and back was not easy. One day to fly in and another day to drive through the mountains to get to the south coast on the Pacific. It was slow and tedious driving. 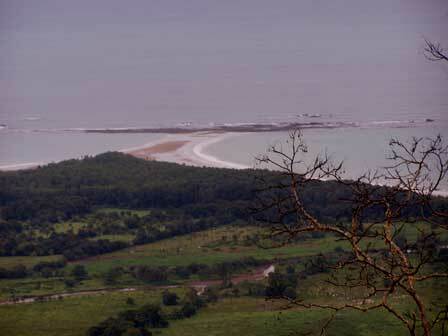 Then it turned out that their house is 1200' feet above the level of the beach up a road from hell. The bull dozer that knocked it out was still parked along it half way up. Our little Hyundai SUV was just adequate to make it up, but God help us if we stopped, since we would have to back down to a relative level spot to get going again. Once there, however, the house was great and the surrounding 18 acres they own was explorable by paths kept open by Gallo, the previous owner who lived just up the hill from them and was the grounds and house keeper for them. We had solar heated hot water and LP gas for the stove and fridge. No electricity, but that way be coming in the next year or so. It was a mixed bag. A real worry about getting up and down the hill. 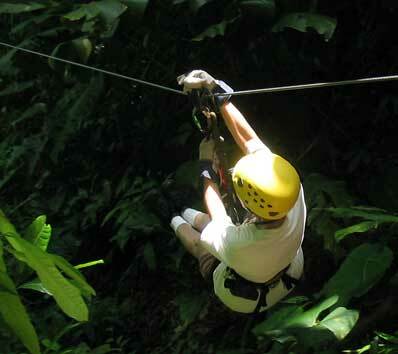 Big worry about doing it in the dark and fear that we might have to do it in a rain storm. Toward the last, however, we got more used to it, although it never became routine. Would I go back. Maybe I'd think twice about traveling four days to spend five days vacating, but who knows? 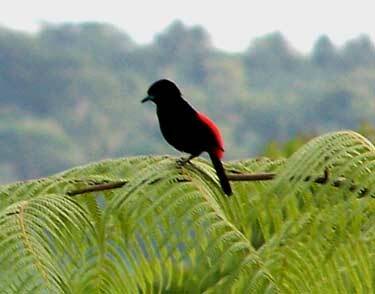 Certainly the bird watching was spectacular. And that counts for a lot. 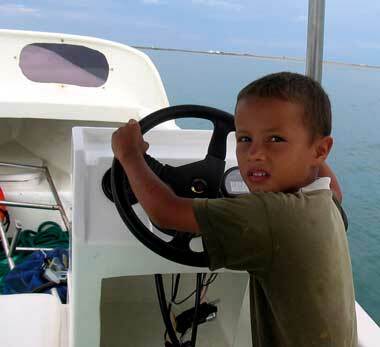 This is Esteban, the son of the boat owner who took us out to the southern bay of the whale's tail to do our snorkling. He actually drove the boat for pop who was sorting equipment at the time. 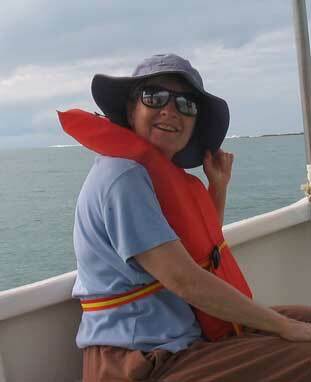 Sherry shows no fear as the zero hour for snorkling approaches. I haven't exposed my ears to water in many years, but in this situation I said why not? 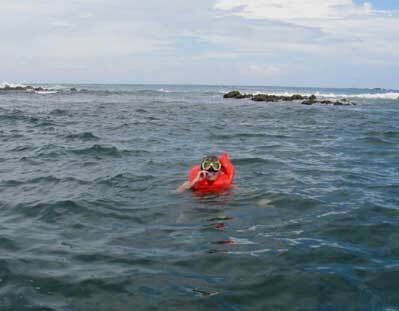 Besides, one of my many ear doctors over the years thought salt water might be fine. Evidently it was. I loved the many fish we saw. 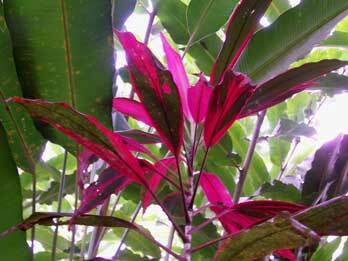 This was one of the many amazing plants at the house. 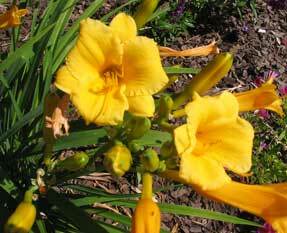 Another, almost the same, had the same color but the flower openings were up, not down. 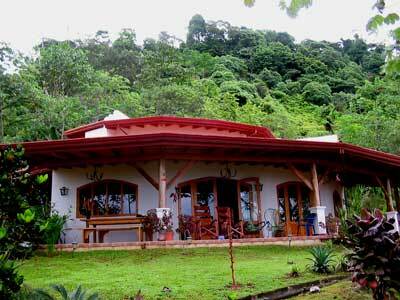 Craig and Marcia Jarvis's house in Uvita. Craig was on hand when we arrived to get us up the hill and to show us how things worked. He came back on our first day to show us around. 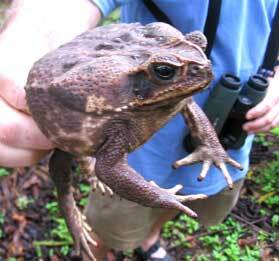 Here he holds a giant toad we found just below the yard. 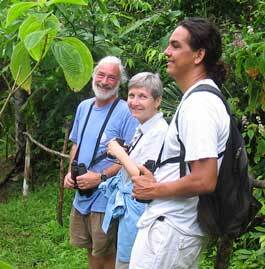 Craig, Sherry, and Javier on our first venture down the jungle path just beyond the yard. 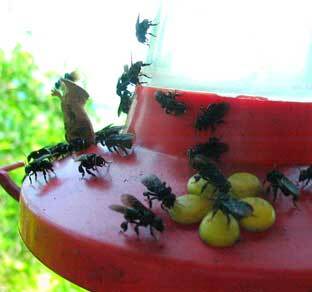 The little bees who loved to drown themselves in the sugar water. 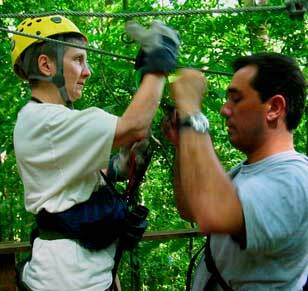 Sherry volunteered to be first to try the slide for life across the void to the next platform during our nature adventure. Caesar locks her in. Turns out he worked in Nashville on the 2131 Apts. near our house. There she goes. No screams, just stoic calm. Safe at the other side, Juan helps her unhook. Three miles down below us the Pacific ocean at low tide along the Whale's Tail. The bay to the left is where we snorkled. 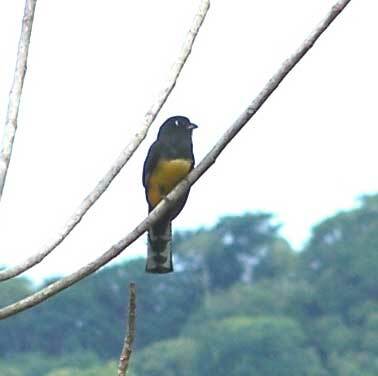 One of the most beautiful of the many birds we saw. I believe this is the Mot Mot. 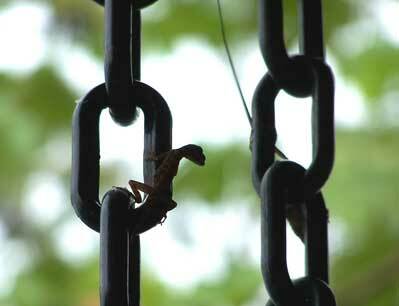 Little lizards liked to climb the chains running down from the water drains. Another lovely bird. I don't remember the name. The noble Toucan. This was my miracle birthday Toucan. May 7, 2005. We saw them every day in the distance. So I wished my birthday wish that they would come into the yard. 30 minutes later they did. 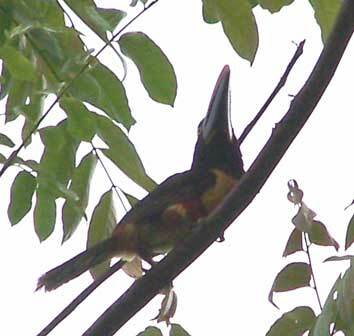 Thus was born a new faith: Toucanism. "If I can, you can. If you can, two can. 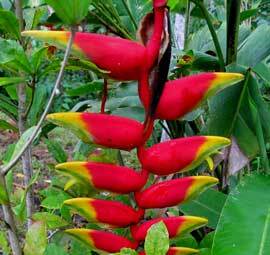 If two can, all can--Toucan." Expect a miracle. Why not? 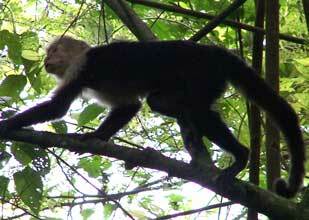 One of a troop of capuchin monkeys we saw on our nature tour through the cacao grove. 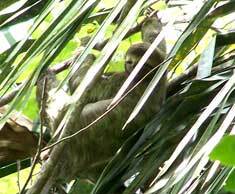 This is supposed to be a 3 toed sloth shot with my camera through a spotting scope. We think it may be a stuffed sloth kept their for tourists. Maybe not. 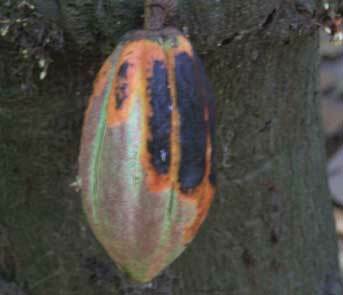 A cacao fruit grows directly from the bark of the tree. The inner meaty seeds are made into chocolate. All the animals love them too. 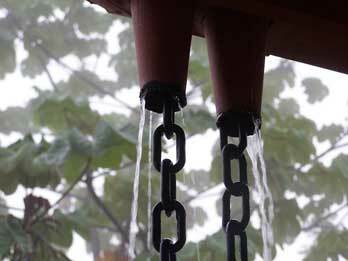 Rain spouts, the water runs down the chains. 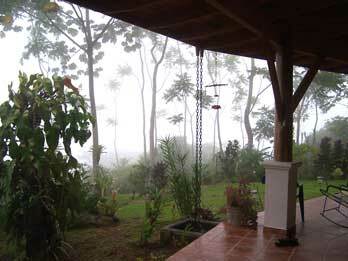 A rainy day up in the cloud forest. 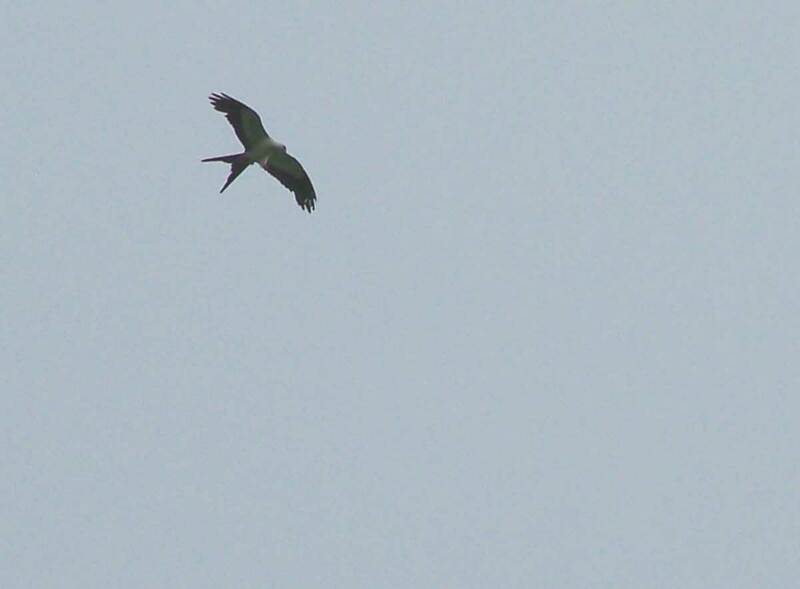 A beautiful swallow tailed kite. The soared in groups. 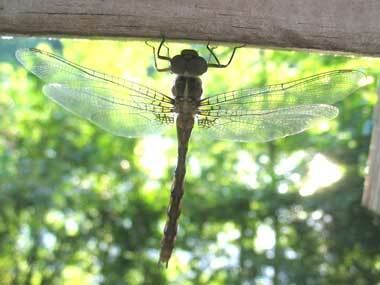 They are said to eat on the wing. 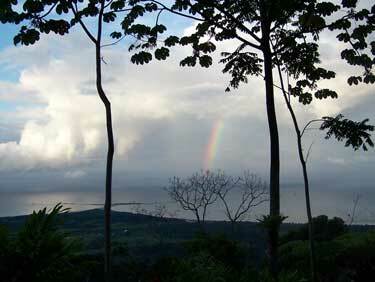 Beautiful rainbow at dawn out beyond the whale's tail. Sherry catches Richard, Wendy, and Rod, at ease on the porch. Bart and baby at Balcon Indoneasian restaurant on my bday. 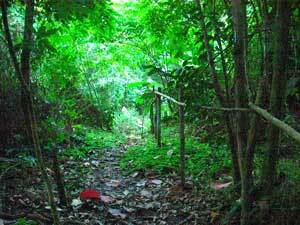 The mysterous path down to adventure in the jungle. 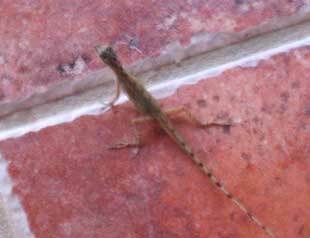 A very shy lizard just before dashing off the porch. I decided to stay home and catch up on the garden. Put in all kinds of new stuff (tomatoes, peppers, egg plants, herbs, etc.) 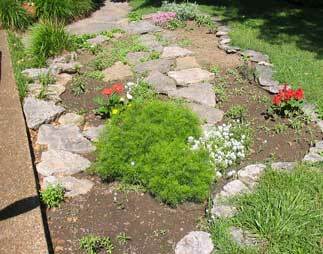 and weeded the entire thing. Also moved the shrubs along the fence line back over to our side, trimmed the hedge, cut the yard, and moved the stack of fence boards out of the front yard to the side of the house. Whoa! Sore back Monday morning, but yoga fixed it. Sunday afternoon I did sneak over to Percy Priest to fish off the bank. How peaceful with no boat or loads of gear to manage. Caught a couple of fish too! 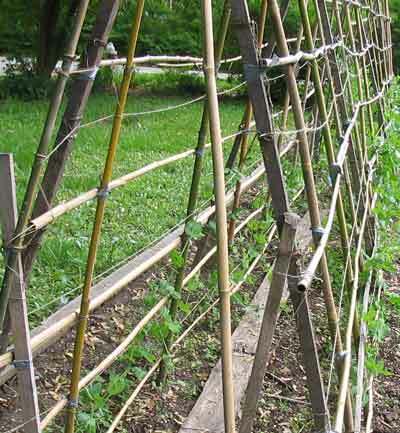 The snow peas and sugar snaps are finding their way up the trellis. The mesclum mix is yummy. But we got an awfully lot of the coarser kinds and not enough of the tender varieties. 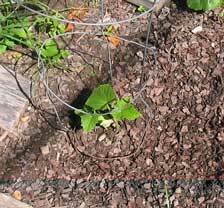 I planted another two rows of green peas (bush type) with a row of turnips in between. Don't know how that will work out. The view from my seat on top of my little lunch cooler. So peaceful and serene. 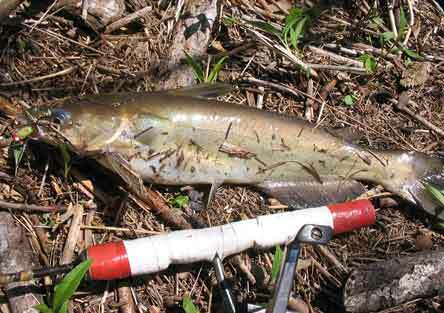 Caught this nice channel catfish on the first try. He hit a little green jig hanging below a little cork. 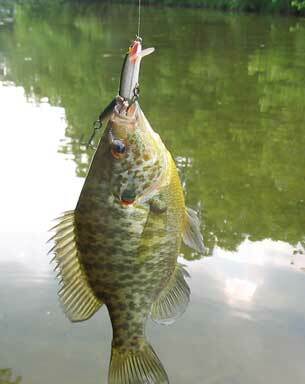 This warmouth took the same lure. You can see it better in this photo. Note the red head. bright and the fish didn't like it. Saturday I tried below Center Hill. Skunk. On the way home I tried Creek P. Ditto. 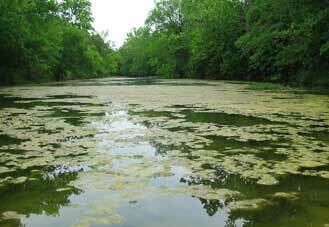 Sunday I tried Brush Creek and Marrowbone Lake. No good. And this is supposed to be the prime time for crappies! We visited Travis and James in Savannah and took a walk at Ft. Pulaski National Monument, which is a large park containing a fort that once defended Savannah during the war of northern aggression. 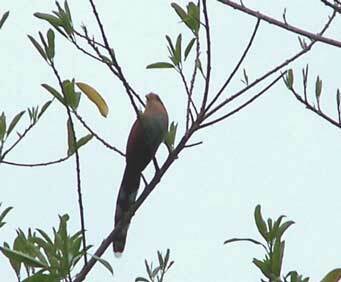 Sherry and I didn't care much for that, but we did hope to see a Painted Bunting. No luck. Later, on Monday, Travis went with us to see another park with a boardwalk over the marshes. We saw a cute baby red bellied woodpecker and an osprey nest, but no buntings, painted or otherwise. 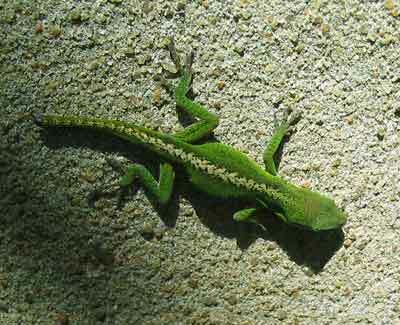 This little green lizard had lost some tail. 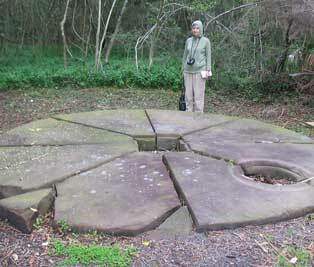 Sherry by one of the several bases for heavy cannon that were located outside the fort. 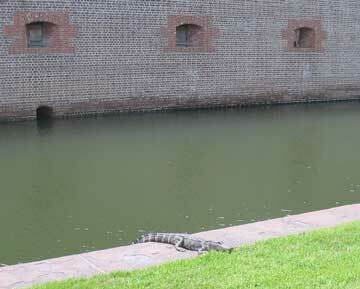 This 6-7 foot alligator was basking along the walkway beside the moat of the fort. We decided to use the grass. 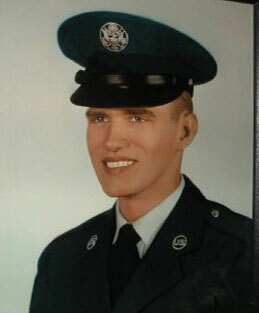 Betty called yesterday and said Mott's memorial service will be at 1pm today. I had decided not to go, but overniteI changed what mind I have. Woke early, so got up and got ready. I was fooling around, killing time until 8, when I thought I'd call Bucky to see if they were going when Sherry said, "Isn't today Daylight Savings Time?" It was, so nstead of having plenty of time I was cutting it short. Got to Bucky's at 11:45. Paul showed up shortly after and we went in his car. Saw all the folks I had almost forgotten and may never see again. Left for home at 3pm and got here around 7. Glad I went. Here most of us are in the parking lot. 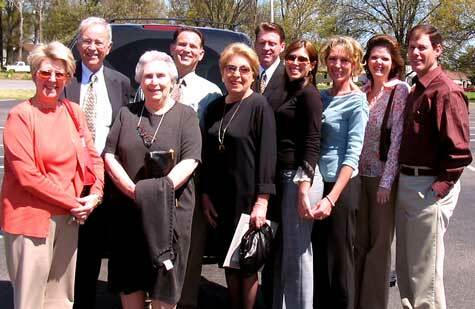 Several from Horse Shoe Lake came later, as well as Bucky and Millie's daughter Carol and her husband Dennis from Jackson, MS. Sue, Bucky, Millie, Paul, Betty, Scott, Jessica, Lucretia, Pam, Jeff, and me, on camera. A photo of Mott which was on the table up front during the service in which Scott and Lucretia said all that needed to be said and the official speaker quoted scripture and did a very decent job, not pretending he knew Mott at all. This photo is the exact way to remember him, at the height of his strength and purpose. Got a call today from Betty Loller, Cousin Mott's former wife. A neighbor found Mott dead in his bathroom. They took him to Little Rock for an autopsy. After that it he'll be brought back to West Memphis for cremation. Betty said they would have a memorial service. I'll go if they do. A month ago I called Mott and he was so drunk he didn't know me. He threw his life away at Horse Shoe Lake. Nobody will ever know why. 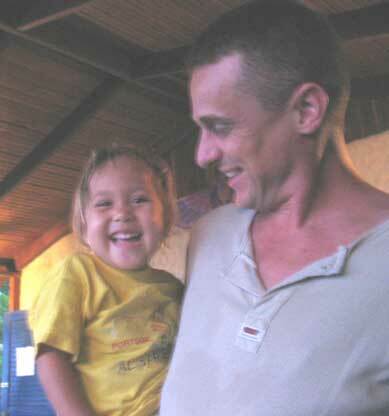 He was like a distant older brother at times. Other times like a crazy stranger. Very sad. 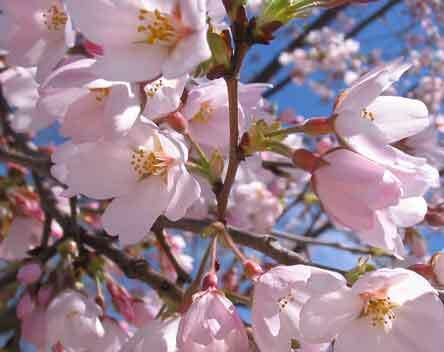 The crabapple blossoms are in full bloom and beautiful. 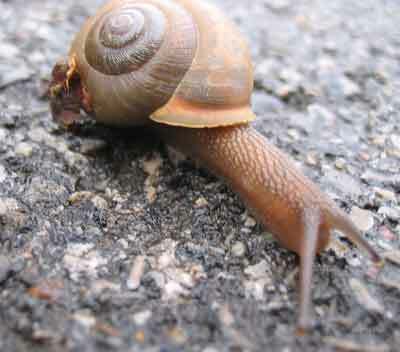 It rained last night and the snails were out in force, crossing the asphalt walk. 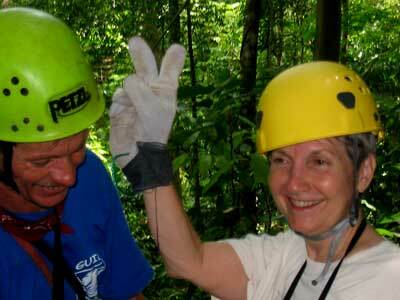 Well, the 25th was Good Friday, so I did some chores and took off for Brush Creek. However, I decided to go by and check out Marrowbone Lake, since it was closer and Dave Dawson had claimed that the crappie should be jumping in the boat. No crappie at all, but I did catch some trout! Seems the game and fish decided to stock them. Hmmm. 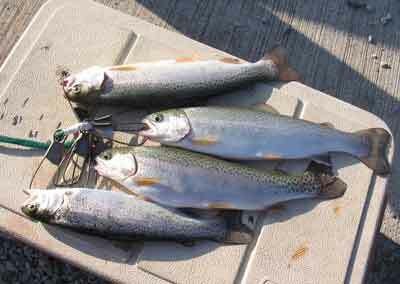 I took four nice trout home and put them in the freezer. Caught them all on the little cheap inline spinner I got at Walmart. Nothing else worked. Since it was on the way, I stopped to fill Sherry's jugs at the spring on Little Marrowbone road. 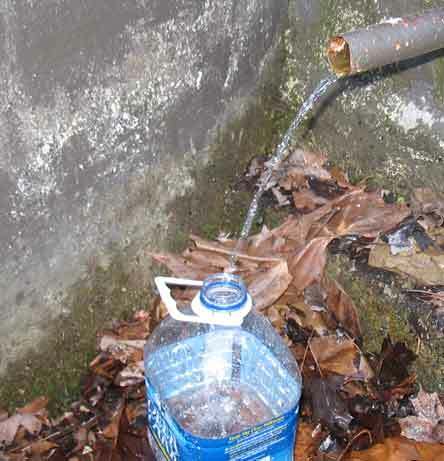 It took five minutes per jug. Pretty slow. Sherry caught my cold so I worked around the house Saturday until she ran me out. Tried the bluff at Marrowbone where I caught the trout yesterday, but my little cheap lure died and nothing else worked, so I went home early to get ready for the arrival of Tina and Bernhart. 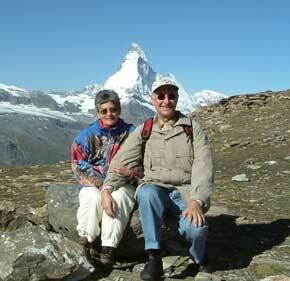 There they are, in front of the Matternorn, which they climbed just before visiting us. Sherry decorated the front walk with pretty flowers for the guests. Mighty nice. 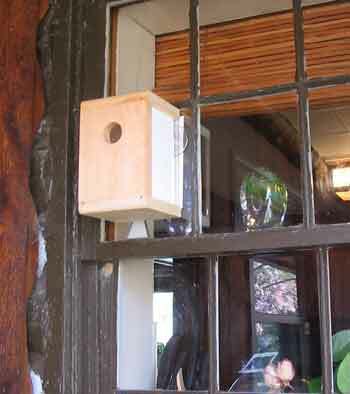 I got this neat little birdhouse kit at the Ladies and stuck it to the kitchen window for the wrens. 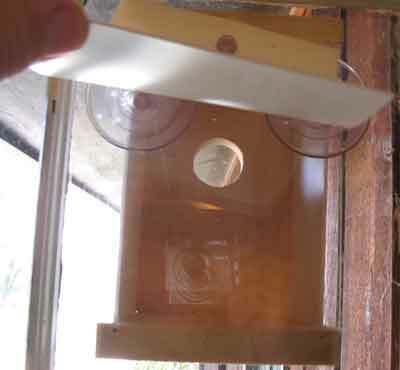 The back is plastic and there is another little flap that sticks to the window inside so that you can lift it to look at the baby birds if a wren ever decided to use it. So far, no wrens. On a rainy Easter Sunday after breakfast and a nice service at St. Ann's we all, Tina, Bernhart, Sherry, and I, loaded up and went to visit Hanley in Lexington. We stayed at a B and B on a horse farm with a very nice widow who has a beautiful house--The Swan's Nest. Had dinner at a nice restaurant with Hanley, Denile, and Natasha. 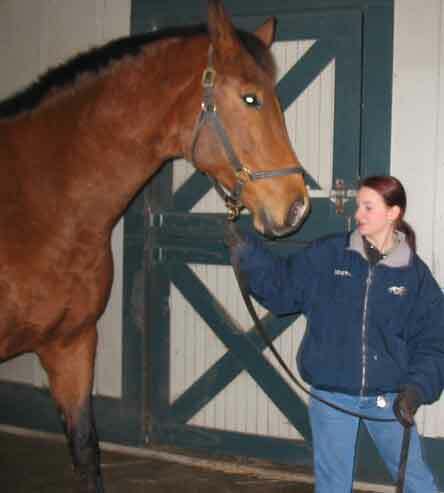 Actually, the horse to the left was at Keeneland, which we visited despite misting rain. 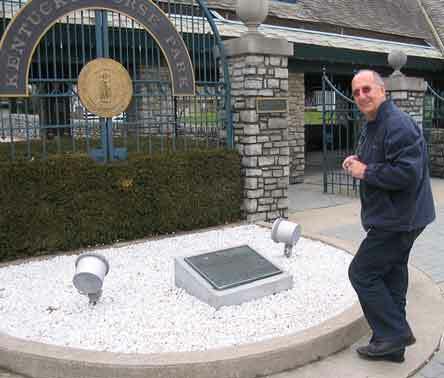 Then we visited the Kentucky Horse Park, where Bernhart got to shoot photos to his hearts desire. It was cold and wet, but interesting. They left for Switzerland Thursday to finish packing for their move to El Salvador. We had fun while they were here and hope they'll come back. 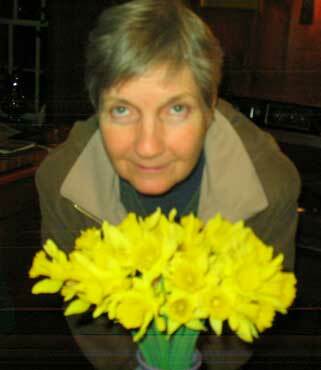 Sherry sniffs some buttercups I brought home a few weeks ago and the Japanese Magnolia is in bloom. Spring is here and a whole new section of the journal is about to begin. Stay tuned for the sweetest time of the year!